Daytona Gold Video Slot Review - Casino Answers! Daytona Gold is a 5-reel, 15-line video slot developed by Top Game, featuring a wild symbol, a free spins feature and a bonus game. You can play the Daytona Gold video slot at Bovada. Daytona Gold is a penny slot game. Bets on the Daytona Gold slot machine are $0.01, $0.05, $0.10, $0.25, $0.50, $1, $3 and $5 per line. You can select up to 15 paylines on a spin in Daytona Gold. You can bet anywhere up to the maximum total bet of $75, which is a good betting range for online casino players. 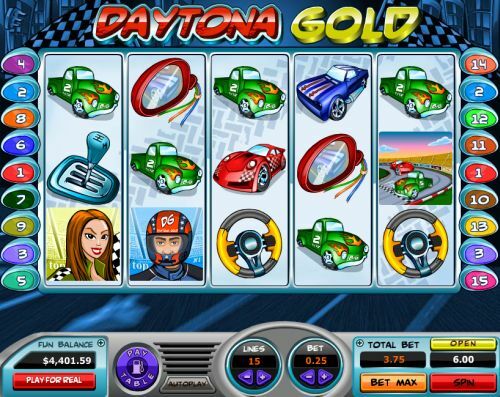 To play the Daytona Gold online slot, select your bet and press the “Spin” button. If you want to make sure you have all 15 lines selected, use the “Bet Max” button instead. The Wild Race symbol is the top-paying symbol on the Daytona Gold casino game. If 5 Wild Race symbols appear on a selected payline, you will win its 12,000 coin top jackpot. The Wild Race symbol on any reel will count as any other symbol to help create a winning combination except for the scatter and bonus symbols. 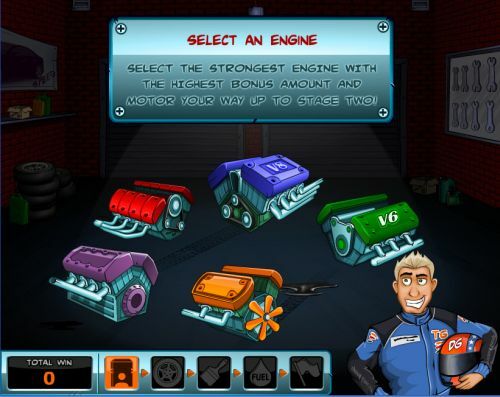 The second highest paying symbol is the Blue Car symbol, which can pay out up to 3000 coins. When the Scattered Checkered Flag Girl symbol appears on reels 1 and 5 at the same time, you will win 10 free turbo spins. Put the pedal to the metal and use these free spins to win big on the Daytona Gold video slot at Bovada! All symbols pay from left to right. Scatters pay on any position. Only the highest win is paid on each selected payline. Scatter and Bonus Race game wins are paid in addition to payline wins. All payline wins are multiplied by the bet per line. Daytona Gold has a basic autoplay mode. You can select from 5 to 95 autoplay spins (in increments of 5) using the “+” and “-” buttons. To start the Daytona Gold autoplay feature, select your number of autospins and press the “Start” button. At any time, you can stop the autoplay mode by hitting the “Stop” button. Racing fans that are looking for a fun video slot to play can find it on the Daytona Gold video slot. There’s an amazing top payout of 12,000X, free spins and a bonus game to go along with the excellent racing theme. You can try the Daytona Gold online slot out when you sign up and play today at Bovada! Can players from the USA play the Daytona Gold slot game for real money? Yes, American players can play the Daytona Gold casino game for real money at Top Game online casinos like Bovada. Where can I read more racing slot game reviews? If you want more video slots like Daytona Gold Slots, please read our list of sports slots to read all sorts of racing, baseball, football, hockey and other slots based on slots.